Sempurai (standing fourth right) poses with the winner of Rafting Challenge for non-governmental organisation (NGO) category – Team Klub Menyumpit Sibu (KMS). 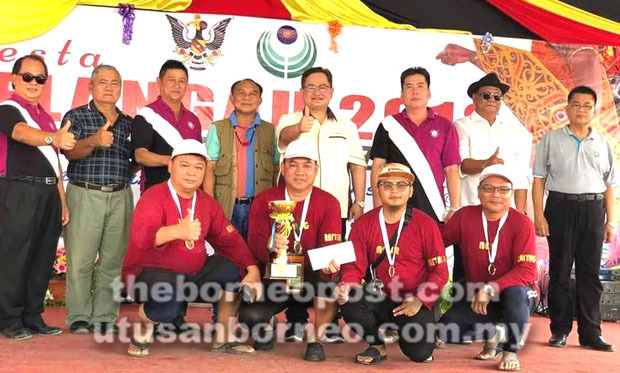 SIBU: The Selangau Festival which is into its third year, parading its signature event – the Rafting Challenge, has received overwhelming response from the public, said Sibu Rural District Council (SRDC) chairman Sempurai Petrus Ngelai. He also noted that from the initial survey by the council staff, the three weeks of fun fair and last three days of festival had attracted not fewer than 10,000 people coming to the carnival venue next to Selangau bazaar. This showed that the festival received good response and support from both locals and visitors, he added. were 35 rafts joining the competition. Inting Nyami flagged off the event. and race management next year. The three-day festival organised by SRDC, was declared open by Tamin assemblyman Christopher Gira Sambang on Sept 7 and ended on Sept 9. “As mentioned by YB Christopher Gira Sambang (in his speech during the launching), upon completion of the Selangau Waterfront project, Selangau Mini Stadium and Selangau New District Office – Selangau will be transformed into a developed township. “As for the council, we will continue to provide more municipal facilities like public toilets, cleanliness, more bin centres and improvement of the current ‘Tamu’ and market,” Sempurai said. Selangau Market and the cooked food stalls– collaboration between FAMA (Federal Agricultural Marketing Authority) and SRDC. for both stall owners and customers. Gira in his speech had announced construction of a new ‘Rumah Asap’ (smoke house) for Selangau town and Sekuau to replace existing ones for both locations. another attraction for Selangau Bazaar.